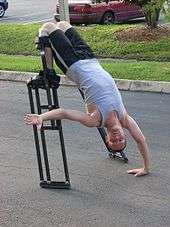 Stilt walker in a 'back bend' on articulated stilts. 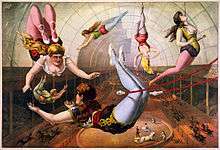 Archaeological ruins and texts show that stiltwalking was practised in ancient Greece as far back as the 6th century BC. The ancient Greek word for a stiltwalker was κωλοβαθριστής (kōlobathristēs), from κωλόβαθρον (kōlobathron), "stilt", a compound of κῶλον (kōlon), "limb" and βάθρον (bathron), "base, pedestal". Some stilt use traditions are very old. 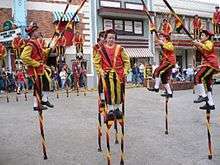 In Belgium, stilt walkers of Namur have practiced fights on stilts since 1411. The inhabitants of marshy or flooded areas sometimes use stilts for practical purposes, such as working in swamps or fording swollen rivers (Merchtem, Belgium). The shepherds of the Landes region of southern France used to watch their flocks while standing on stilts to extend their field of vision, while townspeople often used them to traverse the soggy ground in their everyday activities. Stilts are used for drywall construction, finish painting, and hanging suspended ceiling tile. "Chancaires" school in Saint-Pé-de-Léren (France). 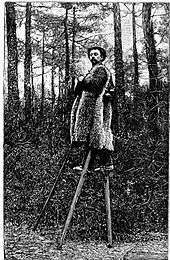 In 1891 Sylvain Dornon, a stilt-walker from the Landes region of France, walked from Paris to Moscow in fifty-eight days. On 1 October 2001 Saimaiti Yiming of China walked 79.6 kilometres (49.5 mi) on 73-centimetre (29 in) stilts in 24 hours in Shanshan County, Xinjiang, China. 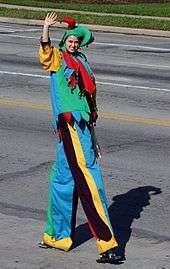 In 2008 Roy Maloy of Australia took five steps on stilts 17 metres (56 ft) high, an unofficial record for the tallest stilts. ↑ Alexander Böck (Apr 13, 2004) U.S. Patent 6,719,671 "Device for helping a person to walk". ↑ George H. Heerington (Feb 22, 1881) U.S. Patent 238,042 "Spring-stilt"
↑ Nicholas Yagn (Oct 21, 1890) U.S. Patent 438,830 "Apparatus for faoilitatina walking"
↑ Gary Ensmenger (Feb 18, 1986) U.S. Patent 4,570,926 "Toe-articulated stilt"
↑ Les échasseurs namurois. "Stilt walkers of Namur : fights on stilts". echasseurs.org. ↑ [s.n.] (26 September 1891). 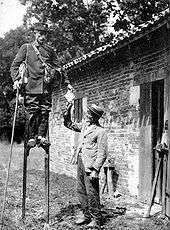 Stilt Walking: Sylvain Dornon, the stilt walker of Landes. Scientific American Supplement (821):[unpaginated]. Accessed March 2014. ↑ "Farthest distance walking on stilts in 24 hours". www.guinnessworldrecords.com. Retrieved 28 February 2015. ↑ "Tallest stilts". www.guinnessworldrecords.com. Retrieved 28 February 2015. ↑ "Fastest mile on spring-loaded stilts". www.guinnessworldrecords.com. Retrieved 28 February 2015.